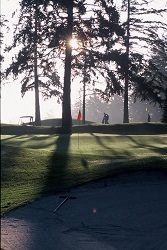 Please contact the Pro Shop 250.386.3401 to arrange your tee time. Gorge Vale welcomes guests and outside players to enjoy the facilities, however, it is a condition of playing at this course that you play within the stated pace of play and do not fall back of the groups ahead. If you fall behind the group in front of you, please pick up your ball, and catch up. In order to create an enjoyable experience for everyone on the golf course, we ask each group to keep pace with the group in front of them. The Gorge Vale Golf Clubs goal is to have our 18-hole rounds completed in 4 hours or less. The golf course and clubhouse serve members, their guests, non-members and groups who book the facilities. All users are expected to meet the dress standards of the Club. To review our Dress Standards (Click Here). Located just minutes from downtown Victoria's inner harbor, GVGC has the proud distinction of being one of the premier semi-private golf facilities on Vancouver Island. Established in 1927, this mature, traditional course with its park-like setting, undulating fairways and rock outcroppings make you forget you are in the middle of British Columbia's capital city.